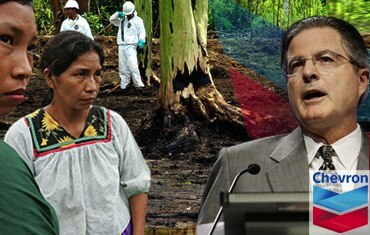 Avaaz - CHEVRON IN THE AMAZON: CLEAN IT UP! CHEVRON IN THE AMAZON: CLEAN IT UP! But the oil multinational has launched a last-ditch, dirty lobbying effort to derail the people’s case for holding polluters to account. Chevron’s new chief executive John Watson knows his brand is under fire – let’s turn up the global heat. Sign the petition below urging Chevron to clean up their toxic legacy, and it will be delivered directly to the company´s headquarters, their shareholders and the US media!